Deposit Products should be set-up in order to mirror the deposit product names and types currently in place at the financial institution. It is also important to note that clients using PrecisionLender’s Relationship Awareness module will want to have a deposit product set-up for each type of deposit product on the bank’s core system that will feed into PrecisionLender through the Relationship Awareness module. The configuration assumptions associated with these products will be what is applied to the profitability calculations for existing deposit accounts associated with Relationship Awareness. The "Save" button is how you save any changes you have made to the product. If you leave a relationship without saving, any changes you have made since the last save, will be lost. The "Print" button allows you to print off the setting of this product. The "Close" button will leave the relationship and take you back to the Adminstration Section. This will be the name of the product and how it is referenced throughout PrecisionLender. The tabs represent different regions or groups of regions that have different assumption sets for the product. Signifies whether a product is visible and active in the product list view-able to users. Products created in order to map Relationship Awareness accounts that aren’t active accounts in use by the financial institution can be unchecked. Capital, or Equity allocated, expressed as a percentage of the balance for the product plus a percentage of revenue. Why does PrecisionLender recommend allocating capital for deposits? Capital at a bank is there to protect against risk. While the most important risk is credit risk, which deposits don't have, there are other risks that affect deposits. These include compliance, regulatory, interest rate, operational, liquidity and reputation. Even though they do not demand the same capital level as loans, there should be some economic capital allocated to deposits. PrecisionLender recommends about 2% in the current environment, although in a higher rate environment we might have a different recommendation. Although some may argue that the level should vary by the type of deposit, with DDA having a higher amount than CD. For ease of convenience we just recommend the same level for all types of deposits. This option is enabled by default when creating new Deposit Products. Return profitability target for this product. Will only apply to products that have an expected balance associated with them. The percentage of deposits on your books that are not available to be used for lending or investments. Represents both the required reserves a bank needs to hold at the Federal Reserve on transaction deposits (NOW and DDA) and the cash letter outstanding on checks written on another institution that are deposited by customers, but not yet collected. Deposit types can be categorized as either Interest Bearing Demand, Timed Deposit, or Zero Interest Demand. Note that if the Timed Deposit type is selected the Transfer Duration or Transfer Rate (next descriptor) will not be displayed because the user will enter the term of the deposit when pricing the opportunity (or the term of the deposit will be mapped for Relationship Awareness Timed Deposit account types). Can be expressed as either a Duration expressed in months, or a Rate expressed as an annual percentage. Transfer Duration is an approximation of expected average life that will be matched for funding purposes to a like point on the fully adjusted funding curve. Transfer Rate is a specified predetermined rate that will be applied to the deposit account type. Can be configured as either a fixed annual dollar amount, an annual percentage of average balance, or both. Regions for which these settings are active, are signified with a check next to the region name. Earnings Credits are used to value balances clients maintain in non-interest bearing U.S. Demand Deposit Accounts (DDA). The earnings credit values indicated when setting up a deposit product are used in conjunction activity-based products, to reduce the amount of fees a client is required to pay for Other Fee Based Products. 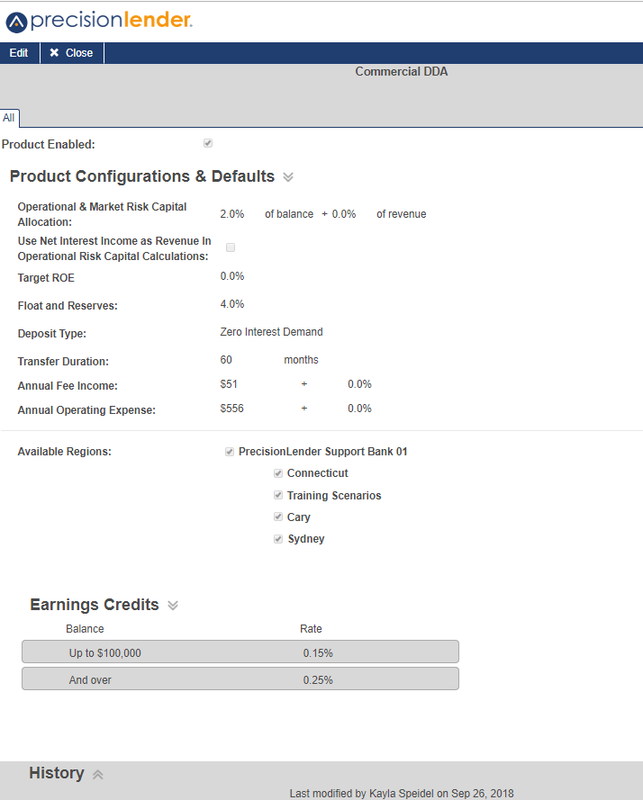 Earnings Credits can be added in deposit amount segments by clicking the 'Add Earnings Credit' button.